The Project 45PP Laundry Unit makes the perfect addition to your laundry. 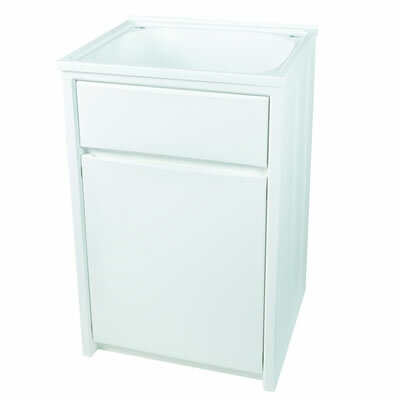 It features a 45L bowl and a largely sized cabinet and comes in a white polymer finish. 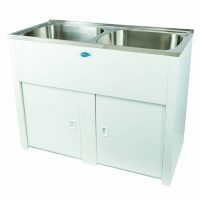 The Project 45PP Laundry Unit measures 570x520x870mm in dimensions and it is suitable for use with mixer taps with a minimum flange or body of 45mm. 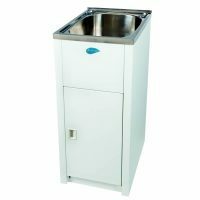 This compact unit offers the perfect blend of style and practicality and has everything to cover your laundry needs. The 45L bowl comes equipped with a 50mm plug and waste and a single bypass with rear waist for added cabinet clearance. The cabinet can be configured either as right or left-handed, and it comes pre-marked with washing machine hose holes. The cabinet is completely moulded with a floor backing board. Enjoy the best in quality with this compact laundry unit. It is incredibly durable and is built to last, which is evident from its solid warranties. 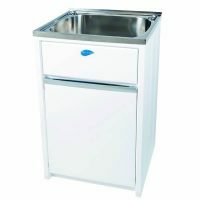 It is backed a 25-year warranty on the polymer cabinet and bowl and a 1-year warranty on the plugs, waste, hinges and rods. For laundry units in Perth that are both stylish and practical, look no further than the Project 45PP Laundry Unit at Ross’s Discount Home Centre. Shop from us online to purchase this great product at an unbeatable price today!